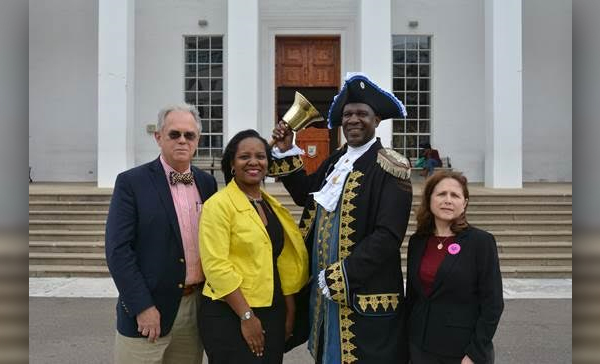 Hospitality Month 2017 is officially underway, with the first winner to the ‘Experience Bermuda’ Scavenger Hunt announced yesterday at City Hall, Hamilton. Malika Cartwright, the Executive Director of Bermuda Hospitality Institute, said: “Our goal this month is to equip as many residents as possible with a fresh passion for, and greater knowledge about, Bermuda. “So when visitors start to flood our shores for the 35th America’s Cup, residents will be ready to answer their questions or direct them to the right spot for local fish chowder or a Dark N’ Stormy. The Bermuda Hospitality Institute has worked to make this month’s offerings as interactive as possible. Starting on April 1, they began hosting an Island-wide scavenger hunt – encouraging people to revisit various sights and landmarks and remember all the great gems Bermuda has to offer. Clues for that can be downloaded each week using the BVO app or picked up from the Hamilton Visitor’s Information Centre. In addition to weekly prizes from places like Cambridge Beaches, Fun Golf and Lindo’s, those who visit the locations found in all 30 clues will be entered into a draw for a grand prize. The scavenger hunt isn’t all that’s happening during Hospitality Month. Throughout April, Rosa’s will be concocting a specialty drink and all proceeds from that, and any blooming onions ordered, will go towards BHI’s various education and training programmes. For more information on the BHI’s upcoming events, visit www.bhi.bm.